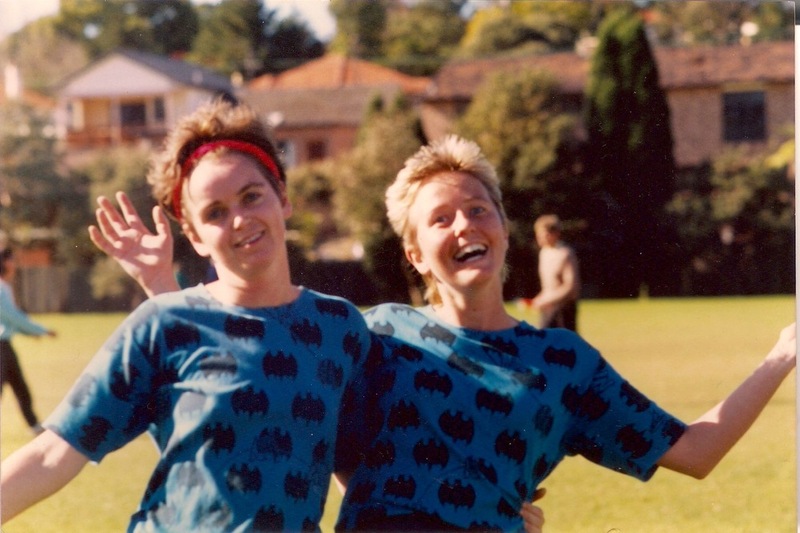 In 2015, Sydney’s Flying Bats Women's Football Club proudly celebrated their 30th Anniversary as a well-established sporting organisation, widely considered to be the largest lesbian soccer club in the world. Over the course of the Bats’ history, it is estimated that more than a thousand women have either been players, coaches or supporters. It has provided a sense of community, friendship and an enduring sense of sporting camaraderie to generations of women. Outside of her commitment to the Flying Bats, Linda was an active performance artist in Sydney, often performing evocative and political street theatre. In 1986 she organised a subversive fashion parade in Heffron Hall, Darlinghurst called "Catwalk Talks" (reported in the Tribune newspaper, 17 December edition). The article caption reads "Fashion shapes women's bodies, and their minds as well". Hand-made garments were fashioned out of 'chux', cling wrap and other kitchen items - presumably as a comment on enforced gender roles. Linda moved to South Australia after her time in the Flying Bats and from 1998 continued her art as part of Shimmeeshok, a performance group. She was instrumental in forming this group and in driving the creative direction of their performances. As part of Shimmeeshok, she continued her guerrilla street performances in Adelaide while she studied. Described as a "sculptor of moments" by fellow artist Ali Baker, she undertook a Master in Visual Arts, graduating in 2009. Interestingly, her final collaborative performance piece was named 'Life of a bird, a life in performance' and the concept of flight and the air featured strongly in her work. In fact, she is noted for having a fascination with airborne creatures (...we can speculate both birds and Bats). Prior to her death, Linda made a bequest to the University of South Australia for an arts scholarship for disadvantaged or isolated students. As remembered in her catalogue of work (published by SASA Gallery), Linda's own childhood experiences made her acutely aware of people facing hardship and she was passionate about supporting people in times of adversity. Anne Himmelreich, an early player with the Flying Bats, remembers the strong sense of community that united players. She explains how joining the Flying Bats was part of her coming out story and stresses that it “was wonderful to meet other lesbians rather than just the one or two I knew. It was so important to for me. It was just heavenly to meet all these lesbians and think I’m not the only gay in the village.” She also recounts how a team with "short, back and sides" was perhaps perceived by those in the early soccer association. There was only one Flying Bats team when the Club was originally formed as part of the eastern suburbs association, with the Club growing significantly over the last three decades to field up to seven teams more recently. In these early years, the official Club colours were not the current black and red but were blue and black. Fran Krix, who recalls joining in the Club’s second year, describes how t-shirts were made “on the cheap…we used to get the sheets of the material to cut numbers out to sew them on.” There was no formal Club structure with players thinking of themselves as being part of a collective. photo: Tracey atkinson and alison todd. Left to right: Back row: (? ), linda patterson, ANN, tracey atkinson, (? ), Anne HIMMelreich, NANCY. FRONT LEFT: DOT. For those early players, who in the first year formed one team, fitness and a chance to socialise were the prime motivations for joining the club. Many of the women who played in the first decades of the Bats had not had any previous soccer experience. Tracey says “it was really kick and giggle; we weren’t as competitive as we should have been.” She remembers “a lot of the time, we’d kick our own goals…it was pretty funny. Honestly…you could have been the average age of the first team was around 30, perhaps a little older than was typical." 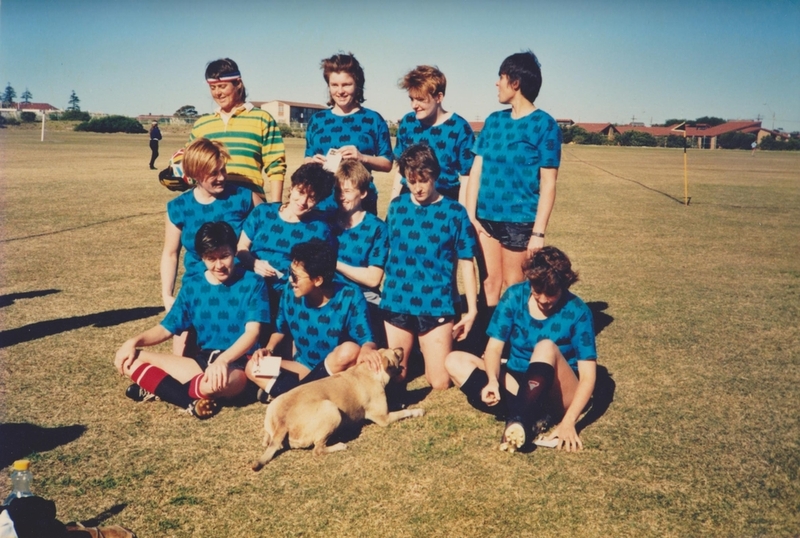 Competitors included the Crones, another lesbian football team and possibly the first of its kind in Australia. Their early colours included bright pink t-shirts and interviewees recounted memories of the their logo - a witch in a gay solidarity triangle. They disbanded after some time and several Crones players were absorbed into the Flying Bats. Interviewees indicated that the Crones were a more competitive club on the field and, similar to the the Bats, were influenced by the feminist and lesbian separatism movements of the time. The Flying Bats (in blue) play the Crones (in pink) on 20 July 1986 in Sydney. Donated by Tracey Atkinson and Alison Todd. Copyright Flying Bats Women's Football Club. In the latter part of the 1980s, problems playing with the eastern suburbs divisions, made some members of the Flying Bats decide to register in a different region. Sue Kerr describes how “we sort of had a little breakaway group” from the original club with some younger members of the Flying Bats applying to play in the Gladesville-Hornsby region under the Flying Bats name. The original Flying Bats team were unhappy that the team’s name was being used in this way and “didn’t get in as the Flying Bats because we’d already taken the name. So they became Chiroptera or something like that which is the scientific name for bat.” The two clubs eventually reconciled and merged again and Linda and her partner joined the reunified club. PHOTO: FLYING BATS 2016. SHIRT DONATED TO THE AUSTRALIAN GAY AND LESBIAN ARCHIVES (ALGA) BY CLAUDIA TARANTO. At the end of each season, there would be major celebrations, a tradition which has been continued over the years. Alison Todd remembers during the early years, “there’d always be a big party at the end, which was always a real highlight, and it was great fun, and there would be awards for everybody in the team and there were beautiful cups” which Linda, a talented artist, put great effort into designing. Recognition of Club supporters, including the presence of partners and parents at the games was a feature from the early years. Tracey's mother, Val, received 'Our Most Committed Supporter' medal in 1986, which similar to the trophies and uniforms were often repurposed and hand-made. The Flying Bats Women's Football Club was formed as a means of providing women with a sense of support and community at a time when options were limited and lesbians were subjected to multiple forms of prejudice and discrimination. 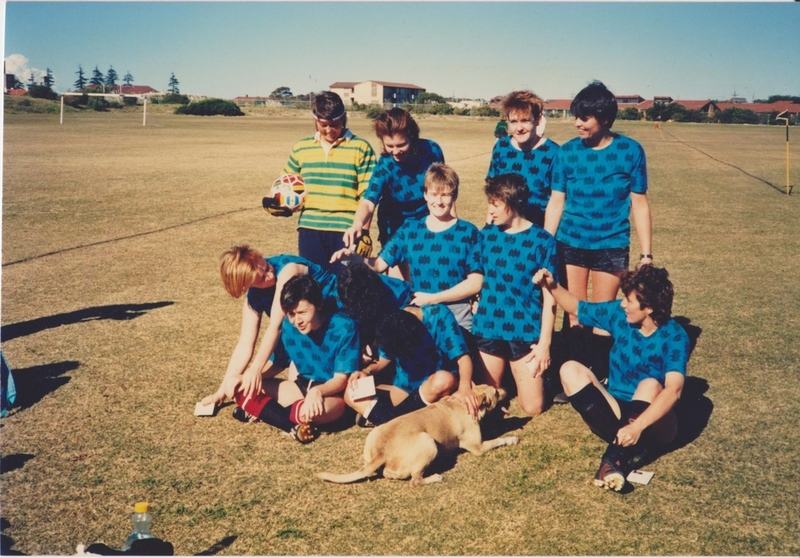 Memories from women who played in these early years emphasise finding support and friendship and a place where women from diverse backgrounds could find acceptance and a sense of belonging.